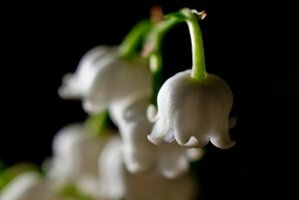 It's May Day, so everybody ought to be wearing lily of the valley — I'm spending the day with my dear old friend Diorissimo, and happily, I still have lily of the valley blooming in my yard. But today I'm reviewing two (not lily of the valley) recent releases: Estée Lauder Bronze Goddess Capri and Jo Malone Plum Blossom. Estée Lauder's Bronze Goddess Capri, for those of you who don't know, is a limited edition flanker to 2008's Bronze Goddess, which was a remake of the limited edition Estée Lauder - Tom Ford collaboration Azuree Soleil. They've been bringing Bronze Goddess back every spring since it launched, and last year they did a flanker, too: Bronze Goddess Soleil. It was citrusy and sort of plain, and I didn't like it nearly as well as the suntan-oil-tinged original Bronze Goddess, which is one of my go-to summer "no brainer" fragrances. I don't like Bronze Goddess Capri as well as the original either, but I do like it better than Bronze Goddess Soleil (and yes, it is no easy matter to keep all those names straight). Like that one, it avoids the coconut and tropical flowers, going instead for a solar oriental with a tart citrus and berry opening, a darkish — it's still reasonably summery — "warm skin" dry ambery base and a pretty blended floral heart. I enjoyed wearing it, and concur with Victoria's conclusion at Bois de Jasmin: "next to most, this fragrance feels refined and sophisticated", but like Victoria, I'm happier with my Bronze Goddess. It's worth a shot if you're still searching for your perfect summer "no brainer", especially if you'd like something a little warmer and longer lasting than the usual. 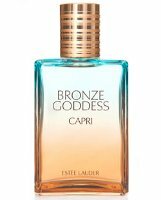 Estée Lauder Bronze Goddess Capri was developed by perfumer Harry Fremont, and is available in 100 ml Eau Fraiche. The notes include cassis, mandarin, lemon leaves, jasmine sambac, muguet, peony, vanilla, amberwood, patchouli and musk. Jo Malone's new Plum Blossom is also a limited edition, as is much of the brand's recent output, although it's worth keeping in mind that the fragrances tend to reappear later if they do well. Also like much of the brand's recent output, it's in a light, clean and dewy style that's perfect for office-wear but that does not warm my (perfumista) heart. Plum Blossom is fruity and pale and fresh, and could easily be the functional fragrance for a shampoo or body mist. It is pleasant enough to wear, mind you, and it's not overly sweet, but there's nothing that makes it stand out from the crowd. Shame, I do love that etched bottle. If you liked English Pear & Freesia, Sakura Cherry Blossom, Wild Bluebell or the London Blooms trio, you may like Plum Blossom a lot more than I did. Jo Malone Plum Blossom is available in 30 ($55) or 100 ($110) ml Cologne. The quick poll: what is your absolute favorite of the mainstream spring releases this year? The only thing I've been tempted to buy so far is the new Prada Infusion d’Iris Absolue. Note: top image is Muguet du premier mai by Simon Bonaventure at flickr; some rights reserved. Favorite mainstream release so far is been L’Eau de Chloe. I have not, however, tried the Jo Malone London Blooms, which seem likely to be something I’ll like… but probably not as much as L’Eau de Chloe. Honorable mention to Billionaire Boyfriend, which I think was Spring 2012?? The Chloe is good, that might be my third favorite, after the Prada and the Stella McCartney LILY. oh, I haven’t seen LILY, that would be another that I’d like to try. Yes, keep forgetting it isn’t in the US yet. Shame, it’s perfect for this time of year. I’m wearing Diorissimo too! Can’t think of another lotv perfume that tops this one. My favorite so far is L’Eau de Chloe. Not sure if it counts as a spring release, but I’m enjoying it very much. I liked both Bvlgari Coral and L’Eau de Chloe to purchase FBs of each. i tend to get the smaller sizes eventhough they end up being more expensive per mL just because I like the variety. I can count on ummmm 2 hands (yikes) of how many perfumes bottle I’ve had to replenish due to having used up the juice. Perhaps this could go to the guilty pleasures thread — speaking of the JM Plum Blossom etched bottle — the notes do not intrigue me but the bottle sure is nice. My guilty pleasure is that I have a collection of limited edition perfumes which I’ve bought because of the special bottles. I don’t go through bottles these days either — buying small makes sense. I read this and ran off to spritz myself with Diorissimo, somehow it didn’t click in my mind that today’s the perfect day for it! As is usual, I’m massively behind new releases, mainstream or otherwise. I only got around to trying Baiser Vole last month. Not my thing but pretty is the right description. Neither EL nor JM sound appealing to me, JM releases have been particularly disappointing of late. JM has really switched gears again since 2010 — it’s too bad for me, but wouldn’t be surprised to learn they’re making more $ with these more basic fragrances (not that they were wildly esoteric before, mind you). I nominate CK One Summer, the manliest way to smell like a sour-apple Jolly Rancher. Kevin will be reviewing it Thursday! I’m crazy about the new Aedes scent!!!! I hope you will love the Plum Blossom on longer wearing — it really is a stunning bottle. Just saw the scent event thing online this morning, looks like a nice bunch of samples too. I never liked Bronze Goddess for some reason, so I don’t even think about the flankers. While I liked JM Pear & Freesia, I’m not sure how Plum Blossom will grab me. I may try to pop into Saks and sniff it since I’ve been wanting to try that Lilac-Rhubarb LE. The Plum Blossom bottle really does look nice (at least in photos). As for your poll: Hmmm. I can’t even keep straight what the newest spring launches have been. Aedes is interesting in a love/hate way, but my vote is probably for SL L’Eau Froide: I was *really* amazed by how much I like it (I loathed L’Eau Serge Lutens). So nice to see you Joe! And of course you smell great — I do love Debut. Very glad to hear that about the SL, I wasn’t looking forward to it and now I’m more hopeful. Can’t comment on any of the new releases cause I haven’t tried any! But I’m curious about the Prada Infusion d’Iris Absolue, and Guerlain Aqua Allegoria Lys Soleia. Will you be doing a review on the Prada soon, Robin? Have you tried the Lys Soleia? Oh, and today I’m wearing the only LOTV fragrance I own – Guerlain Idylle EDT. I have not tried the LS yet. I will review the Prada at some point, but not sure when, maybe week after next? Curious to hear what you think of it! Forgot that I’ve tried a couple of new releases – the Kilian Bamboo Harmony and Water Calligraphy. Both great scents for spring. My DH likes them more than I do, I think (on him, not on me)! The WC reminds me of Alfred Sung Shi, and BH reminds me of Bvlgari The Verte. I’m also wearing Diorissimo today! It’s The Day for it if ever there was one. The only 1 of the LB trio I liked was the iris, but yes — not enough to part with any money. I do love that Dark Amber & Ginger Lily though! I rather liked Peony & Moss, but not enough to part with cash for it. In keeping with our four day drenching I am wearing Apres la Mousson, today. This one has grown on me. Not to love, but to something between like and like plus. I don’t even remember what the mainstream releases are an,ymore, but I am looking forward to those new Piguets in June. Prada Infusion d’Iris Absolue & Stella McCartney LILY is where I have spent my money on spring/summer fragrances this quarter so far aslo. Today it’s cold and rainy so I am wearing V&R Spice Bomb that I also just recently bought. My only problem is that I cant always find it because DH has it! I am jealous of your Prada. I might give in to temptation. I bought the JM Plum Blossom as a gift for my mother. She has only “louder” scents but attends many meetings/church events where a lighter perfume would be welcomed. She also has never had the total JM treatment, with lovely boxes and the bag tied with black grosgrain ribbon. I had to ask the rep to make it nice like that, and so he “dressed” hers, but not the bottle I bought for myself… Customer service is lacking these days, and he was a JM rep working at Neiman’s! (I ended up returning mine, anyway, as it ended up being too similar to Par Amour Toujours, which I already had.). Plum is a nice, safe scent which is also, alas, forgettable. But I dO think it makes a “safe” gift for most “non-perfume” people! Really, and at Neiman’s?? I hope they at least gave you a box? I’ve always had the “treatment”, although admittedly have not bought a JM scent in awhile. Maybe they’re cutting back, I don’t know. Hope your Mom will love it in any case! The ribbon was only for the tester, which he had carefully hidden away near the register! I went to “grab” for it while saying “Am I allowed to touch the hallowed tester?” (or words to that effect) and I suppose that the answer was “NO” because he swooped in and sprayed it on paper for me. I had to ask specifically to have a skin test. Did anyone else have this experience?I wonder if they are trained this way… At any rate, I bought some Chantecaille Frangipane as well, and much prefer the SA there who was more sample friendly! Wow, no, not at a Neiman Marcus. What a terrible shame, I’m so sorry! I forgot all about it being May Day, so I am wearing Pandora. My bottle of extrait just arrived yesterday, so I am reveling in it. Can I make up for it by wearing Muguet des Bois tomorrow instead? It was my first “real” perfume at age ~10, and so far the only LOTV I really like. I am afraid I don’t pay much attention to mainstream releases anymore. Most of them smell very similar to my nose. I am interested in smelling Truth or Dare, although it is unlikely I would buy it, just to smell a mainstream ‘fume that *doesn’t* smell like everything else. Of course you can! It’s still May, for heaven’s sakes. 50 Roses, I also wore Muguet des Bois many years ago and have a bottle from ebay that I love. Spritz away throughout May! i tried estee lauder bronze goddess capri to me it smells like Prada Infusion de Fleur d’Oranger. i desperately want estee lauder to re release the original bronze goddess in all its suntan/coconut glory, i have been trying to find something similar without success. They are still selling Bronze Goddess though — or do you mean it’s been reformulated? I did not smell it this year. LOL…it’s true, we’re staying out of all of that! I’m looking forward to trying that Kilian. I, as a Pradaholic, have been dying for weeks to try new Prada Infusion d’Iris Absolue, but it’s still not around here and I’m afraid that it won’t show up in Poland just as Amber Pour Homme Intense didn’t. How does it smell? Do you think a Pradaholic guy like me could wear it, or is it too feminine? Hope to review it soon — I really haven’t spent enough time with it to answer! Though we are heading into winter i decided to wear IdI yesterday as I haven’t worn it for some time. I could once again confirm that it is my desert island scent . (Even-though I haven’t worn it for some time – and though I now need a change, its still the most me!) So, I’m also eager to hear about the absolue! I can’t say I’ve been tempted by any new releases this spring – largely because I haven’t tried any I did have a quick sniff of KM’s new line a liked the vetiver scent. I had already been to Hermes and sprayed myself silly with a couple of things, so I’ll want to test the KM on clean arms very soon. And I liked the KM white floral…the vetiver was interesting too, but not as much vetiver as I expected? Tried Plum Blossom today and it is just so boring! It really does smell like pale, fruity scented shampoo or hand wash. Shame, cos the bottle really is darling. It really ought to hold something far more special!